Officials from Colombia’s counter-narcotics strategy have overstated the extent of security improvements in regions affected by drug-related conflict, according to researchers. In an analysis of the US-Colombia plan to fight the drugs trade the Washington based think-tank, the Centre for International Policy (CIP), say they found evidence of guerrilla and paramilitary activities in supposedly secure areas. They say their fieldwork detected the presence of guerrillas from the Revolutionary Armed Forces of Colombia (FARC) in rural areas in the La Macarena region, south of the capital Bogota, despite US and Colombian troops being in control of nearby towns. The researchers question the official accounts of the US-Colombian anti-drug programme, known as ‘Integrated Action’ which, they say, have tended to emphasise the gains made in the programme. For example, the report quotes the former Colombian defence minister, Juan Manuel Santos, who claimed in May 2009 that regions which were once ‘refuges for terrorism and narcotrafficking’, were now peaceful. But the CIP study, based on fifty interviews and field research in La Macarena and Montes de Maria regions in 2009, claims that guerrilla activity in the La Macarena region has increased since March 2009. Local leaders and human rights defenders told the researchers, for example, that there was an ‘increase in the guerrilla’s recruitment of children’. Critically, the researchers say that FARC’s influence had not waned to the extent that people were able to ‘lose their fear of retribution for participating in Integrated Action programmes’. Researchers concluded only a few towns in the region were secure. “In La Macarena, there is a very predominant military component of Integrated Action, suggesting that there is still guerrilla activity,” says Adam Isacson, the director of the Latin American security programme at the CIP. 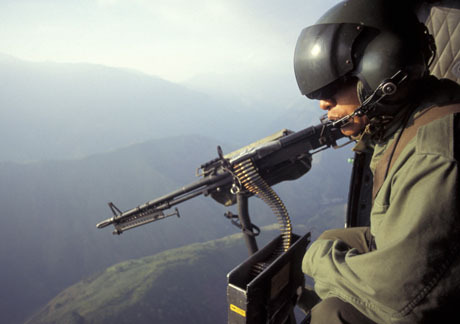 The Colombian defence ministry and the US set up the Integrated Action programme in 2007. The Integrated Action approach marked a shift in Colombia’s counter-narcotics strategy by including state-building goals. Previous strategies such as Plan Colombia, a counter-narcotics strategy devised by the US and Colombia in 1998 had largely relied on military tactics such as aerial fumigation of coca crops and fighting armed groups involved in the drug trade. However, as the CIP report points out, the Integrated Action approach assumed that a successful anti-drugs effort would also involve building up better government services in areas which were either badly governed or in some cases, had no central government presence at all. The emphasis on state-building is supported by other research findings, such as the UN World Drug Report 2008 which says that that weak central governments and large swathes of ungoverned territory provide fertile ground for the drugs trade. But CIP researchers also criticise the Integrated Action governance programme saying that military staff have been assuming duties which they believe would be better carried out by civilian staff. Researchers say, for example, that tasks such as food and seed distribution which could be carried out by humanitarian organisations, were being undertaken by the military. Another example they quote is the road-building project between El Carmen de Bolivar and Chinulito in the Sucre region. Even though the area been declared a safe zone, the project has been entirely left to the military and according to the report, many non-governmental organisation have expressed “strong concern” over the military’s wide-ranging brief and the possibility this will lead to human rights abuses. “The civilian component is lagging behind the military aspect of Integrated Action as there is a lack of resources for these to be implemented,” says Mr Isacson, “The military component of this approach is still very dominant.” The report recommends that de-militarisation should take place soon as the area has been secured. Moreover, there has to be greater resources to fund the civilian component of the programme to ensure that civilians take control over governance issues.